They are honest, reasonable, and very accommodating. They get you in quickly and fix it quickly. I like the workers. I've gotten to know them by name now going to them for so long. They are very friendly, and they respond very quickly. I would tell them that if they have a Mercedes to use them. They always clean my car, wash it, and vacuum it. They do a good job, and I'm happy with the service. I'm going back to them soon. I was using another dealership, an official Mercedes-Benz dealership, and there was a specific part I needed, but they did not help me. I was desperate and found European Sales & Service. It was my first interaction with them, and they immediately jumped on the problem and fixed my car. I was very happy with the experience. They have expertise, they know Mercedes-Benz, they are very friendly, and when you go in there, you feel respected. 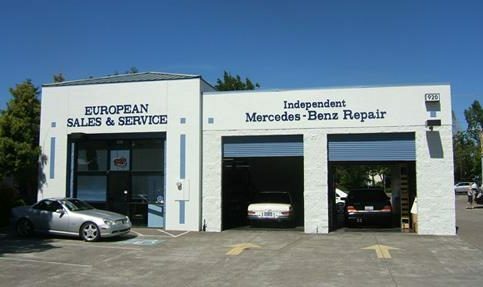 European Sales & Service is a full-service, independently owned repair shop in Santa Rosa that works exclusively on Mercedes-Benz vehicles. The company offers complete service, maintenance and repair, including Check Engine light diagnostics, transmission and air conditioning repair, Service A and Service B maintenance services, major engine overhauls, tune-ups, and more. Its technicians are factory-trained and proficient with all years and models of Mercedes-Benz vehicles. 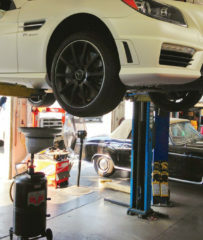 A European Sales & Service technician works on a customer’s SLK55 AMG. How often you wash your vehicle depends on the conditions in which you live and drive. Wash your vehicle more frequently in the winter months or if you live near the coast, where ocean salt is more prevalent. • Before washing, rinse the entire vehicle with a strong spray of water. • Starting at the top, wash one section of the vehicle at a time using a soft sponge, towel or sheepskin wash mitt. Thoroughly rinse both the vehicle and the wash mitt before continuing. • After a final overall rinse, wipe your vehicle dry with a natural chamois or 100 percent terry towel (use of any type of toweling other than thick nap, 100 percent cotton terry cloth may cause swirl marks). • Never wash the vehicle unless it’s cool and in the shade. • Avoid using dishwashing detergents, which may cause paint to fade and oxidize. For exceptional protection, use paint care products specifically designed for Mercedes-Benz vehicles. They can help remove light surface problems and polish your vehicle’s finish to a high gloss by coating it with a complex layer of waxes, silicones, polymers and resins. • Use a sponge applicator or soft cotton terry cloth to evenly apply the paint care product to the entire vehicle, one section at a time. • Remove residue with a soft towel. Mercedes-Benz finishes are highly durable, but regular care is still necessary to maintain their appearances. • Immediately remove scratches, swirl marks, vehicle exhaust, insecticides, industrial pollutants, tree sap, bird and insect droppings, ocean salt and other common surface contaminants—left untreated, they can leave your car’s finish looking faded and dull. • To evaluate your finish, run a clean, dry hand along your vehicle’s clean surface. It should feel as smooth as glass. If it doesn’t, you’re feeling bonded contaminants. • To reduce surface damage, park your vehicle in the garage whenever possible or use a vehicle cover. While the outward appearance of your Mercedes-Benz is most noticeable to others, the interior is what you see most often. To keep your interior surfaces and seats looking their best, use car care products specifically designed for Mercedes-Benz automobiles. • Frequently vacuum the inside of your vehicle and use seat covers if you’re worried about discoloration caused by contact. • Use a cleansing and conditioning formula to clean leather seats and protect them against damaging UV rays. • Wet the wheel with a strong spray of water. • Spray a wheel care product onto the wheel, covering it completely. Apply only when wheels are cool to the touch. • Agitate the surface with a soft bristle brush. • Rinse with another strong spray of water and wipe dry. Q: Do I need to get all the recommended repairs done immediately? A: Generally, yes, but we’ll tell you if a repair can be deferred and when it’s best to get it done. Most times, getting a repair done immediately will save money. Recently, we had a customer with a bad front-strut bushing, and it was only a matter of time before the other bushing went bad. We recommended replacing them both, because it would save on labor—sometimes, it’s just as easy to replace two bushings as one. A: In most cases, repairs take just one day. When we have to order a part, it can take as long as three days. Q: Do you use original Mercedes-Benz parts? A: In most cases, yes. Some aftermarket parts are very good, though. We’ve been around long enough to know which ones are reliable and which aren’t. Sometimes we’ll recommend an aftermarket part to save the customer money, but only when we know the part is as good as an original part. A: We prefer you make an appointment. That way, we can be sure to perform your service in a timely manner and have the parts here. But we accept walk-ins as well. Richard Cordes is a 40-year veteran of the automotive industry and owner of European Sales & Service, a Diamond Certified company since 2003. He can be reached at (707) 836-3960 or by email. SANTA ROSA — Since he was a teenager, Richard Cordes has exhibited a drive to excel, and four decades later, that drive has culminated in an uncommon level of achievement. “In high school, I received two years of auto training, in the course of which I earned my first industry certificates,” he remembers. “After graduating, I worked at a tire shop for about a year before getting hired at a Mercedes-Benz dealership in Marin. 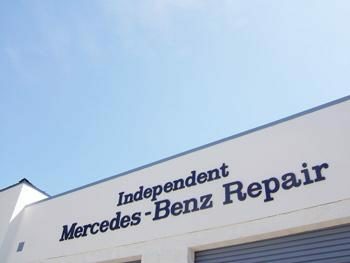 I really enjoyed the challenge that Mercedes-Benzes provided, and during my seven years there, I received manufacturer training in advanced auto diagnostics and repair.” After spending an additional five years at a Santa Rosa-based Mercedes-Benz dealership, Richard decided to take things to the next level and opened his own shop in 1989. A resident of Santa Rosa (where he lives with his wife, Victoria), Richard expresses his appreciation for the diverse Sonoma County landscape. “As an avid cyclist, I really enjoy the terrain here,” he says. “Whether you want hills or flats, mountain trails or road trails, Sonoma County has it all.” Richard also enjoys keeping up with local sports, particularly professional basketball. “My wife and I are big Golden State Warriors fans and try to attend as many games as we can during the season.” Furthermore, Richard enjoys spending time with his and Victoria’s two grown children, Ryan (who works as a service advisor at European Sales & Service) and Lacy. A: A 1956 Ford hot rod with a 392 Chrysler Hemi engine. A: Sushi Hana in Sebastopol. A: Besides excelling in auto class, I would say sports. Even though I never tried out for the track team, I still managed to tie the school record for the 60-yard dash. A: I like them both, so maybe stick a pancake in between the waffles. 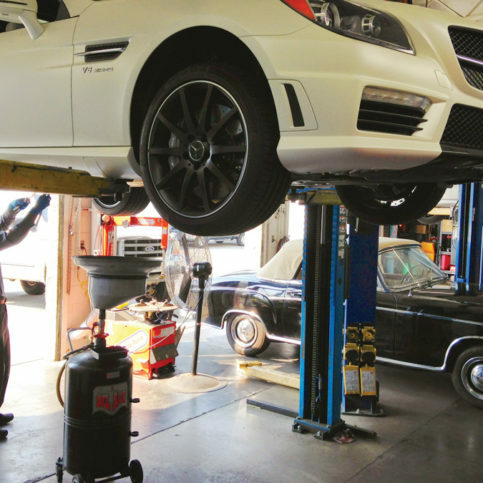 SANTA ROSA — If you own a high-end imported car like a Porsche, Mercedes-Benz or BMW, you’ll want to make sure it gets the best care possible. A good way to do so is to take your car to a shop that specializes in servicing its particular make. Since every vehicle make has its own unique idiosyncrasies, the in-depth knowledge of a specialist can prove invaluable when it comes to diagnosing problems and anticipating future needs. 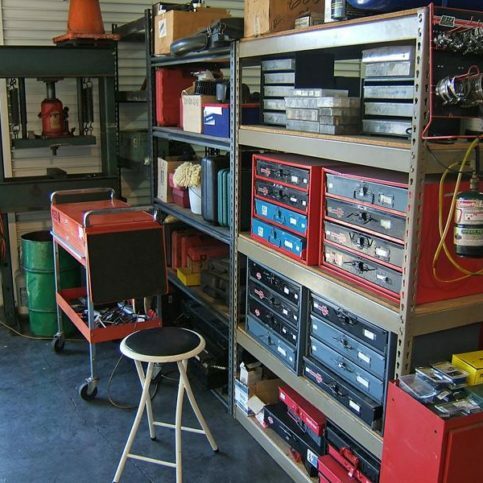 In addition to having the right training and certifications, a specialist possesses all the pertinent tools and technology, including manufacturer-specific diagnostic equipment that a general repair shop might not have. SANTA ROSA — Host, Sarah Rutan: If you own a high end vehicle like a Mercedes-Benz or a BMW, the expertise of a specialist can be an invaluable resource. Today we’re in Santa Rosa with Diamond Certified Expert Contributor, Richard Cordes of European Sales & Service to learn some of the benefits of specialized auto-care. Diamond Certified Expert Contributor, Richard Cordes: Being a specialist means a lot because you’re able to know the car a really well, and every car has their idiosyncrasies. Mercedes does. Porsche does. BMW does. And the advantage of knowing a car for years, you’re able to really pick up on the repairs that are needed. You know what the transmissions are in need of, the power steering, the suspensions, brakes. On the other hand, if you were take your vehicle to a general repair facility, he may not know the ins and outs of your vehicle, and he may not have the technology nor the knowhow of how to fix that particular car, particular complaint. But, a specialist, we do. We know what we’re doing. We have the technology. We have the training. 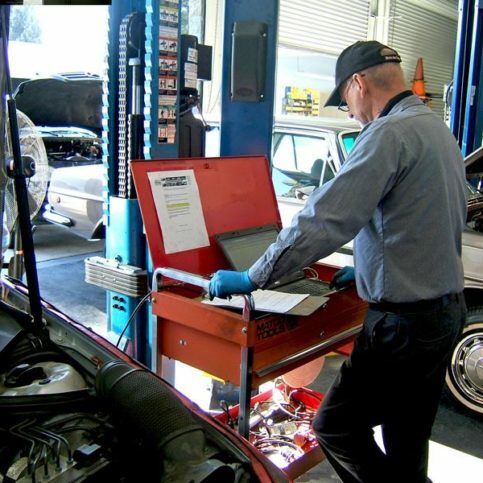 We have the information, the books, the computers, the diagnostic equipment to fix your car right. Ryan Cordes is manager of European Sales & Service, a Diamond Certified company. He can be reached at (707) 836-3960 or by email. A: HenHouse Brewing Company in Santa Rosa. A: I’d go to the past to check out some of the iconic 1960s music scenes. I’d love to see the Beatles and the Rolling Stones in their prime, as well as check out the San Francisco hippie scene. A: Anything with dark chocolate. SANTA ROSA — If you’re interested in buying a used Mercedes-Benz, there’s something you should be aware of. Certain models from 2004 to 2008 are known to have a problem with their timing chains, caused by a defective balance shaft. Essentially, the balance shaft’s gears tend to wear out prematurely, which causes the timing chain to slip. Besides leading to engine problems, this defect can cause your car’s “check engine” light to come on, which is a problem if you need it to pass a smog check. The cost to repair this issue can easily exceed $4,000—a substantial addition to any car’s price tag, much less a used one. So, when shopping for a used Mercedes-Benz, consider your options. One is to avoid models from the 2004 to 2008 range altogether. However, if you do find a car from this period that you like, you should ask the owner if they’ve addressed the balance shaft issue. If they say they have, ask for paperwork to verify the proper repairs were done. SANTA ROSA — Host, Sarah Rutan: If you’re planning to buy a used Mercedes-Benz from the mid-2000s, there’s a potential issue you should be aware of. Today we’re in Santa Rosa with Diamond Certified Expert Contributor Ryan Cordes of European Sales & Service to learn more. Diamond Certified Expert Contributor, Ryan Cordes: If you’re thinking about buying a used Mercedes, there’s something you should be aware of. Certain models from 2004 to 2008 had a problem with their timing chain. It was caused by a defective balance shaft, which I have here. And, basically, what happens, the gears wear out prematurely and without warning, causing the timing chain to slip. And this, in turn, will turn your check engine light on, making it impossible to pass smog. The repairs to take care of this issue can easily exceed $4,000. So, it’s something that I think all people should be aware of if they’re looking to buy a car in that range, which is 2004 to 2008. European Sales & Service : Average 9.0 out of 10 based on 452 unique customer surveys of customer satisfaction. We will always recommend them. We know they're not going to call us back and ask who did you send me. We're very confident in their service. Their expertise, they never hesitate to provide help even though sometimes it's not time yet to get the car in. They'll spend the time because they know it's worthwhile and they're very trustworthy. They just make me feel like a valued customer. The lounge area is very nice, and they offered me coffee and tea, and they are just nice. If you have a Mercedes, go see Richard. He's a competent, honest mechanic. This place is very good. I only use them. Nothing special, they are good at service. That they're just very qualified, and it's a good option rather than going to dealer. First, the price, secondly the speed in which they get everything done, and those are the two main things. They give you very personal service. They look at your car and your options and they treat you as an individual. The quality of the work is quite good. The personalized service they provide, they remember you and your car. They're very personable and they listen to what you have to say. That they did what they said what they do and they accomplished exactly what they set out to do. I have been a loyal customer since I switched from the Mercedes place on auto row. They are very reliable, personable, and courteous. Richard has a wonderful, personable demeanor. He's fairly priced, he uses all quality Mercedes original parts, and he usually is able to get me in and out in the same afternoon. He gives me a loaner car while he's working on my car and I appreciate that. Actually he treated me not like a customer, but more like friend that was taking care of my car. It's good service and you're in and out. I would have to say their people. They are an overall great shop for either service or repair. I would tell them they're very reliable. The work has always been successful. I've been pleased. I think that they're really flexible with getting you in quickly, they're very competitive with their pricing, and their overall work is excellent. Let me put it this way, I own my own business and I have a place where I recommend business and I just put a stack of their cards there. Their honesty, promptness, courtesy and overall, they're a very good business to deal with from a business to business relationship. They're pretty reliable and they don't provide gimmicks. They're pretty truthful. It's easy to ask questions and get answers. I feel they know their products, and they know my car. I have used them for several years, and I know I can trust them. I also feel they are concerned about my car and it's running in good order. I would say the people, the father and son are just wonderful. I haven't interacted with other employees, but I know father and son, and they are great. They're pretty great. The person I worked with was pretty excellent. Everything was nice and quick.